Professional search and selection of specialist and management staff: 7 steps to success! We work closely with our customers when selecting new employees for executive positions and collaborate with supervisors and an HR representative when preparing a job profile. At this point, we focus on the technical background to the job as well as the soft skills, which will be required to perform the future task. We jointly determine the search strategy. 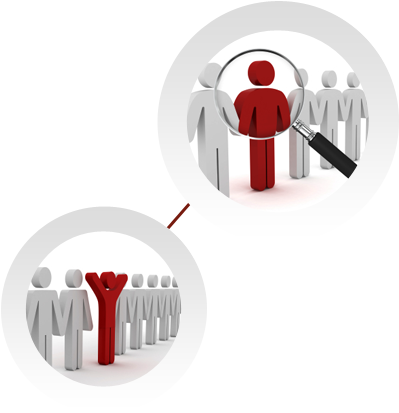 To ensure a comprehensive search for suitable candidates, we use the web as well as social media and established networks. Once we have found suitable candidates, we discreetly enquire as to whether they would consider switching jobs, and listen to their ideas and wishes. After reviewing the application documents, we carry out the initial telephone interviews. Following positive initial contact, we meet the most suitable candidates. Here, we strive to ensure that the venue for this discussion is both discreet and easily accessible for the candidates. To save time, we often travel to our candidates‘ location. Subsequently, during detailed and personal discussions, we determine their hard and soft skills, motivation to change jobs and their ambitions. The facts and our impressions from the interview are included as part of the candidate profile, with which we provide our customers, accompanied by comprehensive application documents. At the same time, we explain more about the new job to the candidates and give them insight into the colleagues, fellow employees, the company philosophy and the strategy of their potential new employer. In this way, both companies and applicants can each get a picture of the other, even before they meet in person. For all subsequent meetings, we are present as observers, moderators and advisers, e.g. to clarify any questions that arise, support those engaging in dialogue and encourage the discussions. In addition, we also engage in contract negotiations on behalf of the customer and ensure the process is implemented professionally and on time. But our commitment goes even further: We remain in close contact with both contractual partners and remain focused on ensuring a smooth integration at the new employer. When needed, we respond immediately, providing advice or tips, for instance when to address challenges in the company or help people find their feet in a new location.